During my holiday off time, I made plans to share more homemaking posts here on the blog like I used to do with my weekly chore prompts. If you want to have a cleaner, more organized home in 2017, please visit each week for project inspiration! 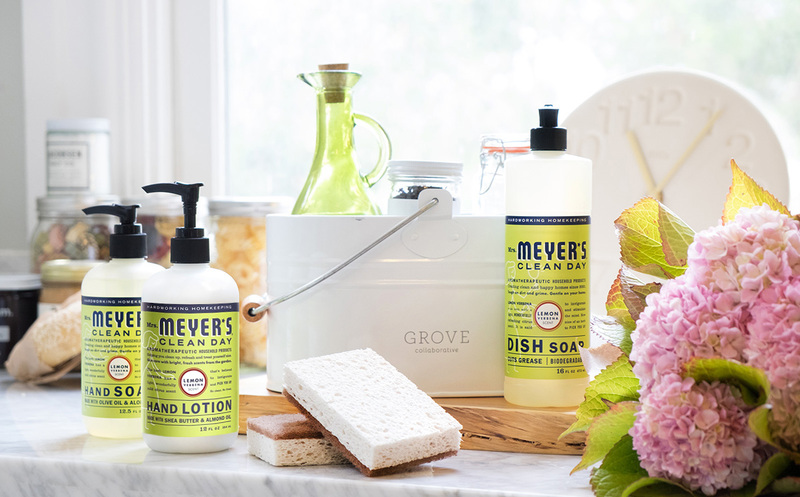 In an effort to go as green as possible with my cleaning, I'm continuing my partnership with Grove Collaborative so you can get a fresh start in 2017 and save on Mrs. Meyer's products too! This post contains affiliate links, which means I may receive a small percentage of sales earned on each fresh start bundle sold via my referral link. Going green is something I’ve been working on for a while, but it’s taken some time as I finish off old products and introduce new greener ones. If you’ve ever bought a brand new cleaner only to realize you have a half-used bottle hanging out in the back of your cabinet, then you know what I mean! Fortunately, this new customer offer from Grove will help get us off to a great start. The set includes a super cute enamel cleaning caddy stocked with supplies from Grove Collaborative and Mrs. Meyer’s. It’s a chic and easy way to keep all my products organized and close at hand, whether I’m pulling it out to clean the kitchen or toting it up to the kids’ rooms. How much more excited would you be about scrubbing the stove if all your supplies were organized in something this pretty? I certainly am. The kit also comes with these Grove Collaborative walnut scrubber sponges. They’re actually made from crushed walnuts, so they’re non-scratch and non-toxic. I stashed one by the sink and one in my cleaning caddy, and I know I’ll be ordering more. I’m looking forward to stocking up on more great supplies from Grove Collaborative throughout the new year. 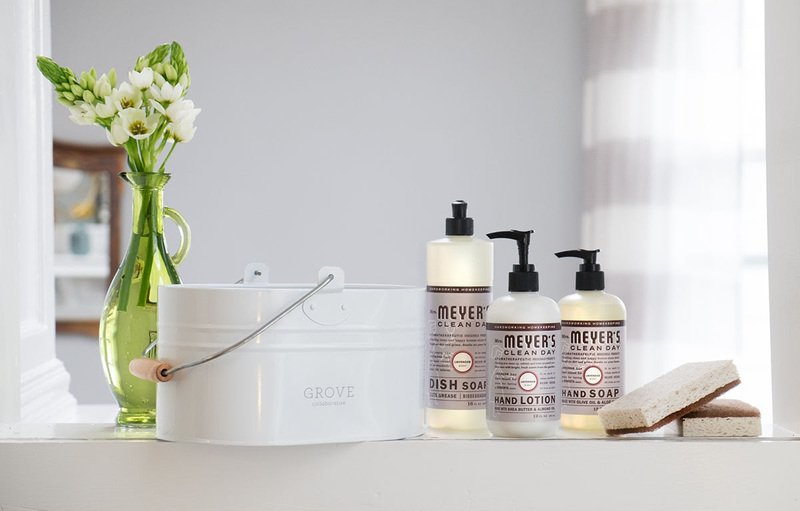 Grove Collaborative makes creating a greener, more organized (and beautiful!) home effortless and affordable. Once you sign up, Grove will ask you a few questions about your home and recommend products you’ll love from brands like Seventh Generation, Method, and Mrs. Meyer’s (don’t miss their house brand too!). They deliver everything you need right to your doorstep, on your schedule so you never run out. I’ve been a member for almost a year, and I’ve been so impressed with the quality of their products, the fabulous customer service, and how easy the whole process is. If you’re already a Grove customer, you’ll get a free Mrs. Meyer’s hand soap with your next order when you use my link. Choose your favorite scent — honeysuckle, lemon verbena, or lavender — when you check out. These brand new lotions are only available at Grove, so don’t miss out on your chance to try them! The offer ends Sunday January 15, 2017 at 6pm PT and supplies are limited. 1. Sign up for Grove Collaborative here . You will receive the Fresh Start Kit for free when you sign up! 2. Answer 4 quick questions about your home that Grove Collaborative will then use to customize your first basket -- this takes under 30 seconds! 5. You made it! Click Finish & Pay and place your order. I hope you'll take advantage of this great offer and come back each week as I help you keep on track with your homemaking in 2017. Because you can't cute clutter! 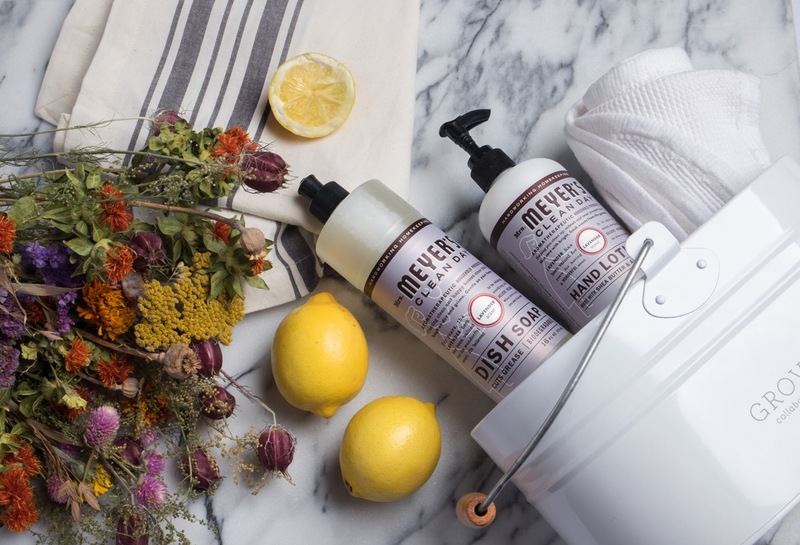 Please share in comments: Which Mrs. Meyer's scent will you choose? It does smell good! I got my kit yesterday! I hope your local store has these items in stock for you to try. I have been meaning to try Mrs. Meyers!! Sounds like it smells terrific! Check them out as soon as you can because they really do smell amazing and clean well.